This week: bookmarks. Lots of bookmarks. More bookmarks than any one person probably needs, unless, of course, you read twelve books at a time. Apparently, in addition to my compulsion to give stuff away, I seem incapable of making just one of anything. I approached this week with two goals in mind. 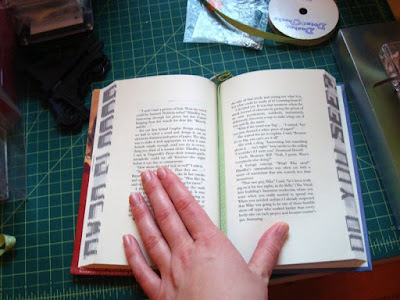 First, make a bookmark for Neal, who seems to simply remember where he left off every night (I've never seen him use a bookmark, nor does he dog-ear the page...mysterious). 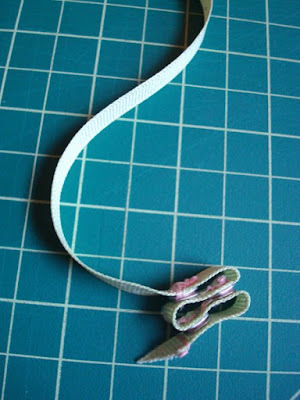 Second, use up a spool of ribbon and a stash of snaps. 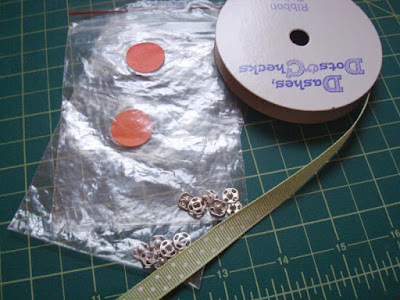 I remember recently going through some random craft supplies, coming across these sew-your-own Barbie outfit kits I've had since elementary school. For some reason, I got rid of the fabric but kept the related elastic, snaps, and thread. Bizarre, right? I liked the idea of sewing snaps onto something, but the closest thing I have to fabric is this spool of ribbon. 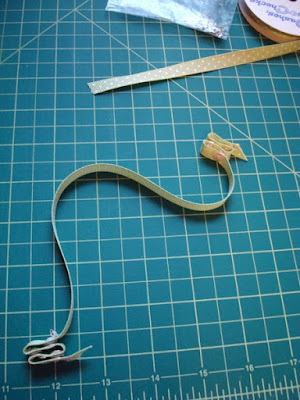 And, as a bonus, you can not only extend the length of the bookmark by unclasping the snaps, but you can also attach it to a second, similar bookmark, a little like Smittens. 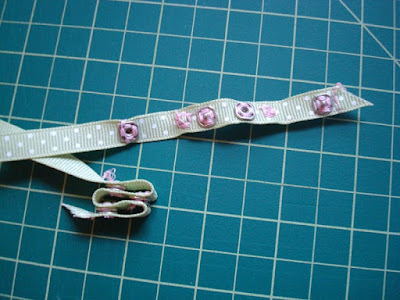 As tedious as sewing snaps onto ribbon in order to make a ribbon candy-like bookmark is, somehow making a couple of these didn't feel like enough for a week's worth of work here at the Makery. 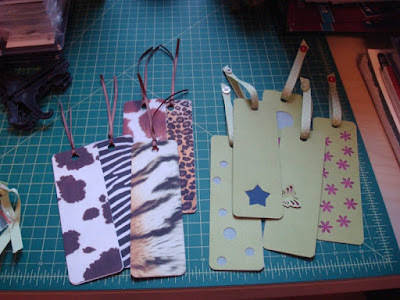 So I carried the ribbon theme over to some more conventional bookmark creations. The first set involved leftover pieces of green scrapbooking paper, translucent and magenta vellum, paper punches, and buttons. 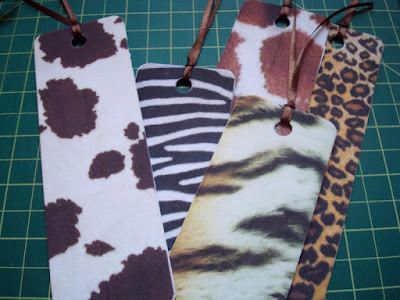 For the second set, I printed images of animal patterns on a few sheets of the inkjet velour paper (seemed like a natural pairing) that I used to line the packaging for last week's project, and paired these with the brown satin ribbon also used last week. There are five in each set, plus the two ribbon candy bookmarks, so I'm not sure how to deal with the giveaway part this week. I guess if you like what you see, you can leave me a comment with your preference (and, hey, if you want all twelve, that works for me!). And, honestly, I'm not too worried about the logistics of the giveaway. After all, the two lovely readers who left comments last week, it turns out, were more interested in the leftover beads than the magnets themselves. Which was fine by me, especially since I was just going to throw those away. I've decided to try and sell on my Etsy shop whatever I can't give away for free here by the end of the week (do you follow that logic?). 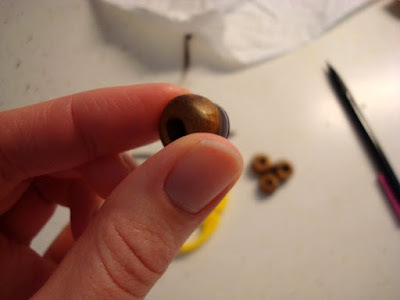 New to the Makery? Read the intro/rules here. 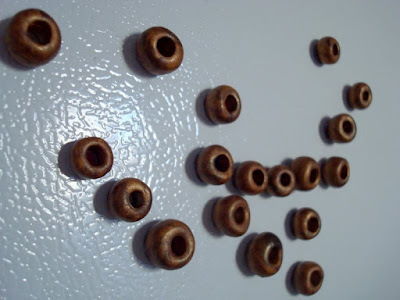 These magnets didn't start out with the intention of resembling Cheerios. And now that they're done, I'd say they look more like the Trader Joe's whole grain version. Believe it or not, when I first started this week's project, initially I wanted to do something with the leftover wire armature I inherited from Neal's random stash of art supplies, purchased to help make this guy, described in greater detail here. But I digress. After fiddling with the wire for a bit, I remembered that I had two packages of gold Sculpey Premo polymer clay, as well as a set of molding and sculpting tools, originally purchased to experiment with making golden owl figurines for my thesis project last year, which, in the end, did include a fair amount of gold glitter but any reference to the owl was omitted in the final product. 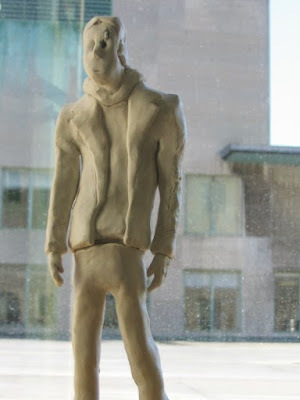 Anyway, I quickly abandoned the wire and started playing with the clay. 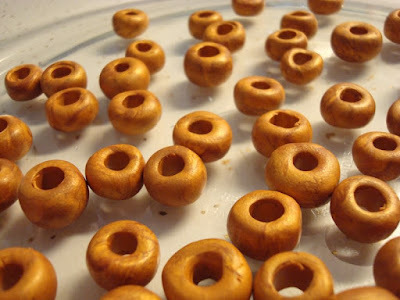 Lots of folks have done amazing things with polymer clay, like Deep Fried Kudzu's bagel roll sushi magnets. 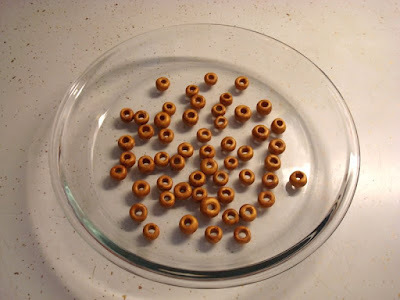 I make Cheerios. 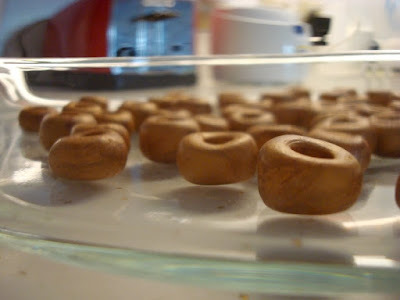 Still not totally sure what I'd do with these cereal-like beads, I baked them in the oven for about a half-hour at 275 degrees, which produced a stinky smell that resulted in about 15 minutes of frantic searching of the Internet for information about whether or not what I was doing was safe. I lived. 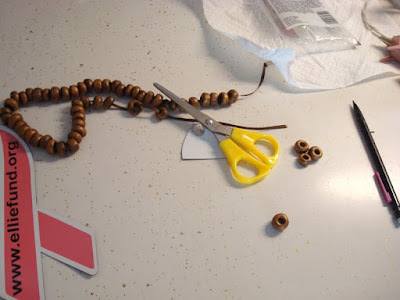 And then I strung the beads on some ribbon and thought about what to do next. 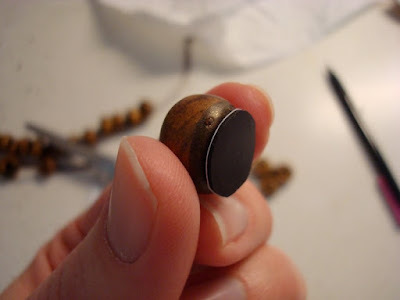 I liked the idea of making magnets, but, according to the rules of this project, couldn't exactly go out and buy the materials I'd need to do that. But then I remembered that Neal had picked up one of those ribbon magnet things you're supposed to put on your car during his last sandwich run to Panera. I'm pretty certain this is not what the Ellie Fund has in mind when they produce these magnets, but I figure a link to their site is the web equivalent (or better) of putting this magnet on the back of my car. The magnet was easier to trim than I thought it would be. 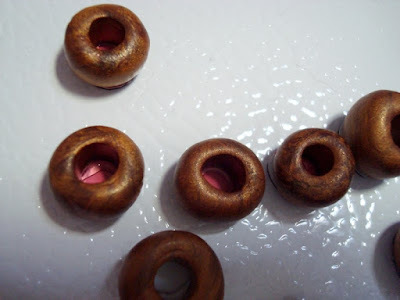 I traced a small circle for each Cheerio/bead, picking the best twenty or so from the batch, and then used my hot glue gun (which, incidentally, matches the pink of the magnet) to attach the magnet bit to the back. This was my first attempt. 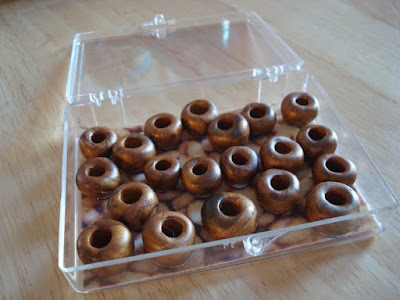 With the second and subsequent tries, I seemed to have more success trimming the magnet bit so that it isn't so obvious from the top and side-views of the Cheerio/bead. 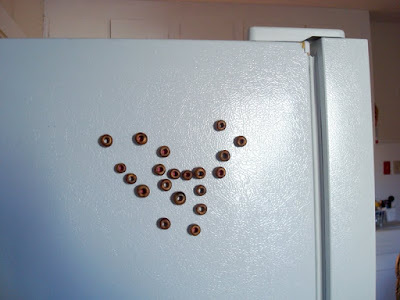 Here's the set of 20 magnets, assembled on the side of my fridge. 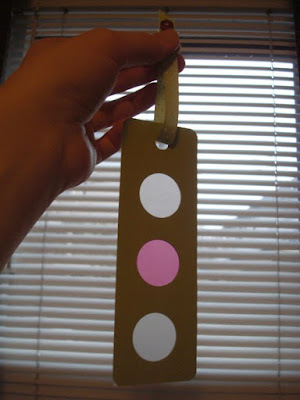 You can see that in some Cheerio/beads the white part of the magnet shows through, and in others the pink part is visible. I have to say, the gold/pink/white color scheme really began to grow on me as I put the finishing touches on these this weekend. I should confess, however, that these will probably not be the most functional magnets on your fridge. Turns out magnet ribbons are not really made to do much more than adhere themselves to a metallic surface. They might be able to keep your shopping list on the fridge, but that's about the extent of their functionality. I've packaged the set in one of the Artist Trading Card holders I had leftover from my class last semester (that's what happens when you miss the last day of class). The bottom of the box is lined with an image of Cheerios printed on a sheet of inkjet velour paper that I originally bought a couple of years ago for a portion of this project. 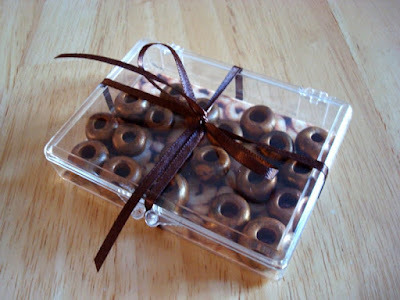 The box measures 3 1/2 by 2 1/2 by about 1 inch and is lovingly wrapped in a brown satin ribbon. Want 'em? Leave a comment and I'll do a random drawing at the end of the week (I have a feeling, should anyone even respond, that I'll know where to send them, since I personally know who I suspect are most of my regular readers, but if not, we'll figure out the logistics of this giveaway after the recipient has been selected). Should you decide to pass on this inaugural product of the Makery, stay tuned next Monday for round two. "At the end of the day, you can't major in Making Stuff." It's unfortunate how infrequently I update this blog lately. When not taking care of my little protege, or feeling guilty about not having more time for other relationships (husband, cats, etc. ), most of my free time recently has been devoted to putting together job applications for the next academic year. I've started a couple of blog-based projects (one day I'll figure out how to successfully use this medium for my art), but I'm not ready to show and tell just yet. There's also a lot of strategizing going on. I feel like where I am is probably pretty typical - and necessary, perhaps - for the first year post-MFA. All that said, I am getting antsy to really start working again. I have a couple of brand-spanking-new ideas but for the most part, I find myself mining past and ongoing projects. 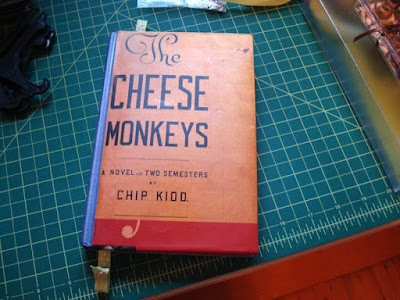 During grad school the constant pressure to produce work resulted in a lot of half-baked ideas and, in some cases, boxes of print projects and other products that I never really got around to distributing or utilizing in any satisfying way. I guess this is all part of the strategizing I mention above. There's a lot of raw material that I'm trying to re-present in slightly reconfigured ways. Hopefully all of this effort will result in a showing or two over the course of the next year. Stay tuned for that. In the meantime, the other thing keeping me from making work is a strong predisposition of late to cease contributing to the piles and piles of stuff we produce and accumulate on a daily basis. Something happened between childhood - when I collected many a trinket and souvenir - and my mid- to late-20s - when clutter, artistic or otherwise, became my nemesis (maybe if I stay put for more than four years at some point in my life, I'll be better about hanging on to both people and things). I blame getting married, moving cross-country, and beginning grad school, all in a period of less than six months, for most of my obsessive-compulsive tendencies that seemed to emerge with a vengeance around that time. This predisposition to hang on to very little, I find, is seeping over into my practice as an artist. I think that must be part of the reason why I became interested in Mail Art (sending and giving things to others) and the Internet (a truly ephemeral medium). Much has been written about the gift-like quality in a lot of artists' work. I think many artists would agree that the process is often a lot more personally and creatively satisfying than the end-product, often much more interesting to those outside this process. Then there's the issue of storage. Not only do I have the desire to let go of my art once it's "finished," but even if I wanted to keep it, I have little space in which to store it. All of this is a long, rambling way of introducing a self-imposed challenge, one that will hopefully simultaneously satisfy my need to make stuff while using up some of the hundreds of dollars worth of supplies I've accumulated over the past few years. The rules, otherwise, are pretty simple. 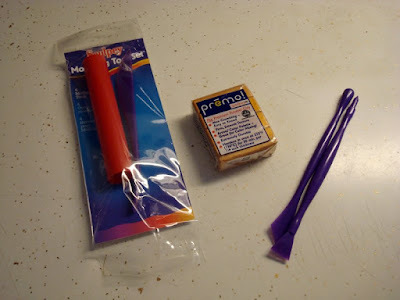 Using only what I already have on hand, I will make one thing (art, craft, cat toy, etc.) each week, document it, blog about it (by 10 p.m. every Monday evening), and then send it off. Unlike past projects, there will not be a separate blog and I do not expect anything in return. I've pondered the problem of how and to whom do I distribute this stuff for a few days now. Initially, I thought I'd send each finished product to someone I know, hopefully having someone in mind as I make stuff. But getting rid of my clutter, even if it is reconfigured in an interesting way, might just be contributing to someone else's clutter. I'm not sure how I feel about doing that unless it's solicited in some way. Then I thought about doing giveaways each week but of course, the worry there is what happens if no one wants what I have to offer, even if it is for free? But my projects have met with failure before; this certainly wouldn't be the first time. So, giveaway it is, at least for now. If you like what you see any given week, leave me a comment and I'll do a random drawing at the end of the week to determine who the lucky recipient is. That's the basic premise. I wasn't going to post this until Monday, along with the Makery's first product, since I have a bad habit of getting excited about a project, getting started, and then losing steam before I've accomplished much of anything. But my first product is actually already done and ready to post, so I thought I'd give you a little intro/preview ahead of the Makery's weekly deadline. Check back on Monday evening for the full post of week one of this experiment.